Our first stop on this trip was Salmon Lake (Lac au Saumon), a little peaceful village in the Valley of Matapedia, where the region’s annual Festival of Guitars was held. 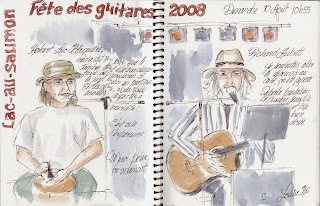 Richard was invited to perform at the Festival, as well as exhibit his handmade ‘Aubut’ guitars. Despite its name, I did not see any salmon in this place. It was only later in my journey that I discovered that salmon fishing is a favorite pastime of many locals and a huge industry of the region. While Richard sang, I ventured around the lake with my camera and took a quiet walk on my own. By the water, I met two little Chinese girls playing by the water. They have been adopted from China by a Quebecoise couple. I spoke with the couple and got into an interesting conversation about the Chinese identity. If the girls grow up in Quebec, speak French, eat Canadian food – and not speak a word of Chinese, would they still be considered Chinese? How much of our identity is linked to the language we speak, the food we eat, and the color of our skin? The question of identity in our melting pot world is increasingly complex. But I am happy for the girls that they found a loving home, instead of being left behind in a crowded orphanage in China where no one has time to pick them up and give them hugs. I pray that these Quebecoise Chinese children will grow up confident of who they are, and write their own stories one day. While Richard and his friend performed on stage, someone sketched a picture of them. Her name is Louise Bo, an independent artist from St. Florence, a nearby village. She reminded me of Diane Lane, and is very pretty. I sat next to her, watching her pen fly across the page, and her brushes filling her journal with water colors. I told her I wish I could draw like her. She said she is an autodidact, which means self-taught. And she told me her story of starting her atelier from nothing. There was nothing else besides her art that she wanted to do. I admire her talent and her passion. I told her that I would love to come and visit her atelier. She invited me for a visit and shared that she would like to paint a picture of me if I went. I felt that the brief connection we had could grow into something more, and I look forward to my visit to St Florence, her village. Later that afternoon, I visited an art exhibition in a nearby church and found Louise’s work on display. She has a style of simplicity, and has knack for capturing the essence of the moment. I learned from her that with passion and self-belief, one can teach oneself anything.